Today marks the fifteenth anniversary of when I moved to San Francisco. I originally came here for college and wound up staying to build my career. Not that I had any other plans. This isn’t about me though — I wanted to look back and consider everything that changed in the past fifteen years. Spoiler alert: a lot has changed. In some cases, not fast enough. Let’s start with the obvious. I can’t compare the price of avocado toast because nobody was making avocado toast in 2003, so we’ll have to look at other prices. Fifteen years ago an adult Muni transfer was one dollar, and a monthly pass was $35. You could save on transfers if you were downtown by purchasing a bag of tokens, which cost slightly less than the cash price of a transfer. Muni still used paper transfers back then, if you were lucky a driver might hand you an all-day transfer instead of the normal 90 minute one. Housing prices also skyrocketed of course. In college I lived out in the Parkside neighborhood and paid $585 a month for a room in a shared house. It’s hardly the most exciting neighborhood, even by Outer Sunset standards, but now you’d pay around $1,000 a month for a room out there. No wonder adults making six figures live with roommates long after college in San Francisco these days. Due to a large donation SFMOMA significantly expanded. 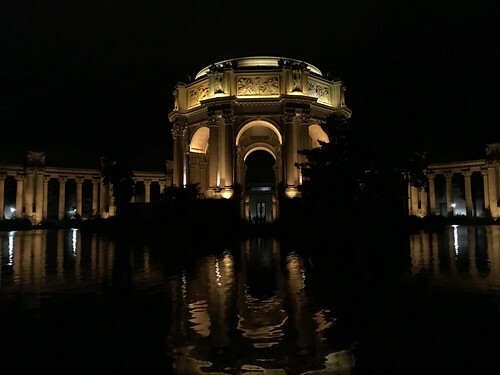 The Exploratorium found a new location along the Embarcadero, and the outdoor plaza at its old location — the Palace of Fine Arts — underwent a lengthy restoration followed by landscaping work. The quirky Musee Mecanique decided not to return to the Cliff House once restoration work wrapped up there, opting to stay at their Fisherman’s Wharf location instead. The first phase of Muni Metro’s T-Third line opened down Third Street along the bay. Aside from everything else along that corridor, it would go on to serve the brand new UCSF Mission Bay campus. The first skyscrapers in SOMA began popping up with Salesforce Tower recently taking the crown as the tallest in the city. Its neighboring Millennium Tower opened a few years earlier, promptly sinking and leaning over. The replacements for Doyle Drive and the eastern section of the Bay Bridge were completed after decades of planning. The Bay Bridge was infamously damaged in the ’89 quake, and Doyle Drive wasn’t predicted to survive the next big earthquake. Westfield took over the SF Centre mall, expanding it to the old flagship Emporium building next door. Despite a strong opening day this was a mixed success in retrospect, with retail stores dying out in favor of online shopping. At least it actually opened, unlike the nearby 6×6 mall which is still completely empty. Just last weekend the new Salesforce/Transbay Transit Center finally opened (sort of) and we got a fancy new park out of it to boot. This complex replaced the old Transbay Terminal, which had been damaged by the ’89 quake too. The last vestige of elevated freeway north of Market Street finally got the axe due to a combination of earthquake damage and long-running unpopularity, leading to a new Octavia Boulevard and the revitalization of the Hayes Valley neighborhood. The old freeway over Octavia Boulevard was supposed to make room for low income housing. Construction still hasn’t even begun on it yet! The Central Subway — phase two of the T-Third project — is still under construction. At least there’s visible progress. Same with the near-constant work on the Twin Peaks Tunnel; will this be the final time it’s closed off for months? Somehow I doubt it. And then there’s the train tunnel to the new Salesforce Transit Center. Not an inch of dirt has moved yet, even if the alignment plans have been finalized. Don’t even get me started on the plans to fix Geary Street’s awful transit. That’s been a third wheel of SF’s politics long before I moved here — or was even born if you want to go back that far. The most shameful things that didn’t change were the somehow still undeveloped Hunter’s Point shipyard site as well as Treasure Island. Both have their own challenges of course, and the nuclear waste contamination doesn’t help. All the foot dragging there is just dragging rents up. The city’s homeless situation improved a little in recent years with new tactics including Navigation Centers. Yet the success rate is at least two orders of magnitude below what’s needed — hundreds helped vs. tens of thousands in need of help — to declare any kind of success would be beyond premature. There’s still a long road ahead, we must do better here. Venture capitalists had begun funding tech companies in San Francisco back in the 90′s, but over the past fifteen years they became willing to fund anything and everything in SF — modern taxi companies, food delivery, questionable juicing products, even restaurants. Food and transit aren’t generally high margin businesses, so it’s hard to see why investors would look at these industries and see a cash cow. Would VCs have invested in these businesses if they were headquartered in, say, Nebraska? It’s something to think about next time you’re using a money losing service backed by VCs like Uber. Where to start on this one? While the Bay Area has a long history of high end dining, the Ferry Building reopened as a food hall shortly before I moved here; a sign of what was to come. The city became a lightning rod of trends from food to cocktails to coffee. “Fine dining” with its waiter service and starched tablecloths somehow made way for experimental fast casual, chaotic dining. Fifteen years ago a good coffee establishment wasn’t easy to find. Making the trek to Blue Bottle or Ritual was a time commitment for many of us. Fortunately the “third wave” coffee trend made its way across the city after a while. One thing that hasn’t changed are the tough, hard-working, and often heavily tattooed folks behind the counter rushing out top quality drinks and dishes at a breakneck pace. Please tip them well. The Outside Lands concert series started in Golden Gate Park, proving that San Franciscans love shivering in the cold while listening to music — and paying for it too, unlike the long-running free Hardly Strictly and Stern Grove Festival series. Dolores Park went from an odd scruffy park to the victim of its own popularity. I still miss Dolores Park Movie Night. The recent refurbishment of the park didn’t change much in terms of the crowds, but at least the bathroom lines are shorter. A number of long running music venues shut down, but others came to fill their place — some not publicly, and often not legally either. One of my first SF music venue memories was The Pound over at Hunter’s Point, a punk club that didn’t last long. New forms of art and theater emerged seemingly out of nowhere. From Nonchalance we got some weird interactive stories, including (my personal favorite) The Jejune Institute. Local immersive theater show The Speakeasy became a mainstay, bucking the trend of temporary immersive shows. A bunch of pop-up selfie-friendly “museums” appeared like the Color Factory and the Museum of Ice Cream. Sunday Streets became a thing ten years ago, but it still feels like it was yesterday. It became wildly popular in the Mission, with varying degrees of success in other neighborhoods. From kids learning to ride bikes to adults working off their brunches, there’s a little of something for everyone there. For some reason the cultural phenomenon known as the “Burning Man rapture” seems to have subsided. Fifteen years ago when it was Burning Man the city emptied out. Now, it doesn’t seem like the lines are any shorter or BART is any less crowded. In fifteen years you can expect a lot of things to change in the ebb and flow. Yet this is still a city that remains artistic, innovative, and kinda quirky. For such a small city I’m often surprised to hear about something new to me that isn’t new to anyone else. Keep on surprising me, San Francisco.